TLDR; Gated or ungated content is an age-old debate with a lot of factors to consider, which is why the decision is far too objective for the internet to answer for any given brand. In this post, we’ll break down what each of the pros and cons are, main motivators driving both sides of the argument, outliers you may not have thought about, how we conducted our own B2B controlled experiment(s), and what other options you have available when it comes to nurturing leads. I embrace critical thinking. I believe it’s the single most important tool marketers can have in their arsenal. It’s crucial for driving efficiencies and effectively supporting problem-solving processes through logical reasoning. Becoming a true critical thinker is not an easy thing to do. It requires attention to detail, and the ability to both question the status quo as well as ask difficult questions, even when unpopular. Critical thinking is the driving force behind good marketing. As Vice President of the Marketing team here at Dynamic Yield, I’m always pushing us to ask ourselves if we are doing the right things. A recurring topic during our weekly meetings had been content gating. More specifically, we contemplated whether we should continue gating our guides and case studies. What does gated content mean? Visitors are required to complete a web form in exchange for content assets. What is ungated content? Content is free for download without any barriers to access at all. It’s become an age-old debate in the short lifespan of content marketing, to which there have been many experiments with no clear right or wrong answer. In this post, I’ll address some of the rationales frequently referenced within the larger marketing community and walk you through the methodology behind our own test as a B2B technology solution operating within the world of SaaS. Lead gen – The ability to track who is engaging with your content and aggregate their contact info to create a lead. Potential leads lost – All the crucial details associated with visitors filling out a form, like name, email address, company, and more can never be used to follow up or nurture them into becoming a customer. Premium content effect – Create a sense of FOMO with exclusive materials not available anywhere else. Assessing demand for content – Understand which pieces of content are resonating the most with your audience and inform the development of new assets. Greater reach – More easily amplify how many eyes land on each asset, improving its chances of being shared and engaged with. Reach a limited audience -Forms create friction, preventing some visitors from deciding your content is even worth it. Folks also don’t typically share content that isn’t readily available. Boosting SEO – Increase the amount of organic traffic landing on your content and improve your position in the SERPs. Lost SEO benefits – No links, no ability to rank for keywords as Google is unable to crawl the HTML of these resources. Improved customer experience – Provide consumers all of the information they want at their fingertips, a near necessity in an expectation driven economy. Critical messages unheard – Valuable information associated with your industry or brand gets trapped behind a form instead of influencing target audiences. Unfortunately, even with everything laid out in front of you, it still doesn’t answer the question of what makes the most sense for your business when it comes to content gating. Which is why another important step in the process is to carefully factor your own unique marketing goals into the equation. This is obviously critical for any business looking to develop continued relationships with new or existing visitors — the information gathered allows you to properly identify those who are interacting with your brand in valuable ways. 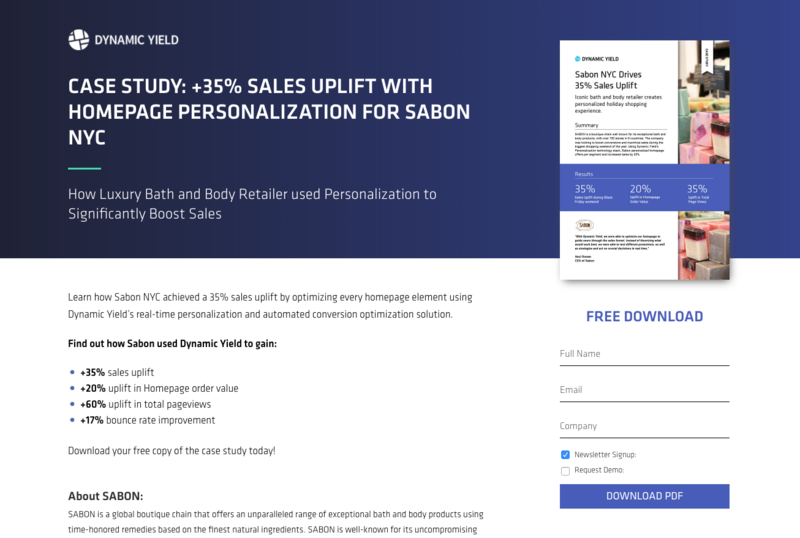 A few simple form fields can go a long way when it comes to qualifying and nurturing a lead into a customer, and once you have that magical email address, the barrier to outreach doesn’t exist anymore. There’s no arguing that by removing roadblocks for visitors and making important content more easily accessible, you will scale your brand’s overall reach and establish a larger audience. So, if getting more eyeballs on your content is the main goal, this is a no-brainer. The hope is that in paying it forward, audiences will recall your brand during critical moments in the customer journey and act, make decisions, or transact with you. And the greater the audience, the greater the chances, right? While the above are common arguments for why you should gate your content or not, there are some other things to think about that will be important in deciding on what’s right for your own business. The decision to gate or not really can often come down to the resources available to you, which largely depends on a company’s size and whether or not they are in a comfortable place financially. Typically, smaller companies have a lot more to lose from relinquishing their marketing forms than that of a well-off enterprise. With limited resources and budgets, for many, the investment that comes with creating content for the sole purpose of returning an ROI in “brand awareness” may not end up worth the cost. That’s not to say a great piece of ungated content can’t drive significant traffic, conversions, or even other high-value web inquiries like demo requests, newsletter subscriptions and so on. So your guides, research reports, webinars, etc. are behind content walls. You’re also producing long-form blog posts, thought leadership articles, videos, infographics, tools and more, all of which are free and can be used to drive brand awareness. These content types should simply be made to work harder for you, tackling new or trending topics, sharing a unique point of view, serving an important function for your target audience, providing entertainment, or even teasing premium or exclusive content visitors won’t be able to find anywhere else. As publishers are coming to find out, if the content is truly valuable, people will subscribe or even pay for it. Continuously A/B test and optimize your content across desktop, mobile web, and mobile apps. A counterpoint to why you shouldn’t gate your content, people these days just expect access to free content. We live an expectation-driven economy and operate within an information age, meaning if needs are not met quickly enough, our customers will move on in search of what they are looking for somewhere else without thinking twice. This notion applies a bit differently to B2B, where the decision making process is naturally more extensive and drawn out, but a case should still be made for ensuring the right content gets into the right hands at the right time. The biggest reason why businesses don’t ungate their content is the loss associated with generating valuable lead information. This reason, alone, has continued to fuel a seemingly endless debate around gating, despite numerous experiments deployed and results gathered from various sources. But what these tests, as well as the general rhetoric, fail to acknowledge is that there are other ways to identify unknown users that don’t involve requiring them to fill out a form. Through anonymous visitor tracking, you can actually build rich customer profiles that can be used to personalize experiences that help you meet your business goals. For more on this, I urge you to keep reading! Historically, our content assets, including guides, research reports, and case studies, have always available on our site behind an email capture form because we want to use these high-quality assets for lead generation. We want to know who specifically accessed a piece of content, and most importantly, and the ability to run targeted sales outreach against users that had downloaded a piece of content. In doing so, we’re able to marry this data with our existing marketing processes to kick our outreach programs into high gear. With that being said, we’ve tried to minimize friction by asking for a minute amount of information from a visitor. This is why most of our content download forms include just three simple input fields: full name, email, and company name. And recently, we began auto-populating form fields to help expedite the form fill process even further. Knowing the real answer behind whether or not we should gate content could only be determined by running a controlled experiment over an extended period of time, that’s exactly what we did. We also considered the fact that different assets serve different purposes, and therefore developed two separate experiments: one that focused on guides and research reports, and another that focused on case studies. In each experiment, we served gated landing pages to 50% of the visitors, while the remaining population received an ungated version. The ungated version replaced the form with a call-to-action button and included a small message underneath it that read, “no email required.” The button, which stated, “Go to Download Page,” in addition to the disclaimer, made us feel confident that people on this landing page would easily understand they wouldn’t need to provide contact information in order to download the asset. Some people who visit or land on a content download page and find out it is gated will choose not to fill the form. By ungating assets, more website visitors will read our content. But that wasn’t why we wanted to run these tests. The more interesting question was if there would be any collateral impact after ungating content and the effect on other metrics, especially demo requests. Discover difference in CTR over time. Increase subsequent demo request submissions for each audience. After 144 days running the test, we finally achieved reached statistical significance and upon analyzing the results, uncovered some pretty interesting insights. First, that we saw 62% more downloads when ungating case studies, and 15% more downloads when ungating guides. People who visited our case study landing pages were more inclined to download PDFs when they were not gated, which makes perfect sense and isn’t very surprising. However, 13% more demo requests came through for people who download gated case studies using forms. Interestingly, with >99% probability, people who had already submitted a lead gen form to download a case study were more inclined to submit a demo at a later stage. A clear indication that individuals who are motivated to proceed in the face of a form are serious about connecting with us — an excellent qualifier in the lead nurturing process. For guides, we saw a 4% increase in demo requests for people who had downloaded guides using forms, but the results remain inconclusive. In terms of gating case studies: We want more people to read our case studies; therefore, we decided to completely ungate them. However, we also made a decision to include a demo request form at the end of every page. These changes will hopefully encourage more people to read our case studies and submit demo requests. In terms of gating guides and reports: Since the collateral impact of ungating guides and its effect on demo requests was inconclusive, we decided to let all guides remain behind a form. It’s still unclear if there’s a correlation between guide downloads and demo requests, but we do know one thing, and it’s that we definitely want to know who downloads our guides. Earlier, I mentioned the use of anonymous visitor tracking in helping to surface relevant experiences for those who you may not recognize by name or email. It’s powerful technology we’ve been experimenting with first-hand, so I wanted to share a test we’ve launched in hopes of inspiring you to think outside of the box when it comes to approaching how you use content to nurture potential leads. 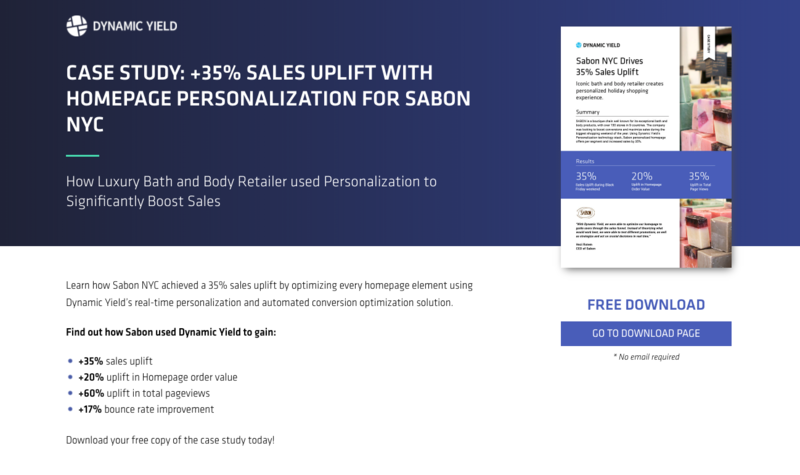 Below, an Account-Based Marketing (ABM) widget deployed on the Dynamic Yield site acts as a “Personalized Company Hub,” which showcases a logo of the company visiting us and recommends content based on the industry that company belongs to. The results after just one month were impressive, positively influence almost every metric that we’re tracking. For those exposed to the widget, conversion rate has gone up dramatically, along with average session duration and pages per session, confirming the widget encourages people’s curiosity. With so many amazing techniques available to marketers these days, businesses no longer have to feel backed into a corner when it comes to making a decision about gating or not gating content. There are many alternatives to help aid or satisfy all arguments. There are also semi-gated models, which is something we’ve seen more companies begin to embrace. This model exposes only a portion of a piece of content (typically an interesting section, such as an executive summary chapter) before asking the reader to fill out a form to reveal the remainder of the content. Data doesn’t always lead us to a clear path. In this case, it reassured us and supported our decision-making process. While some findings are still open for analysis and can be further tested, the breadth of our testing provided us with conclusions that were clear and actionable. I urge you to start investing in experiments for your own business. Simply adopting our findings for your own ecosystem may lead you to the wrong outcomes. Instead of focusing on other people’s experiences, run your own test for your own company and be more skeptical and data driven — the results might just surprise you. There are pros and cons to each approach, and each organization should ultimately test and implement the method that works best for them.